A commitment from Lake Gibson (Lakeland, FL) offensive tackle Zachary Teter (pictured above) was Virginia football’s third offensive line commitment in the class of 2019. Bronco Mendenhall is well on his way to signing another sizable offensive line haul and doing what he set out to do when he took over as Cavalier head coach … building up the offensive line. He has kept to his word. The Hoos signed five offensive line prospects in the class of 2018 and five more in the class of 2017, Mendenhall’s first full class as UVA head coach. 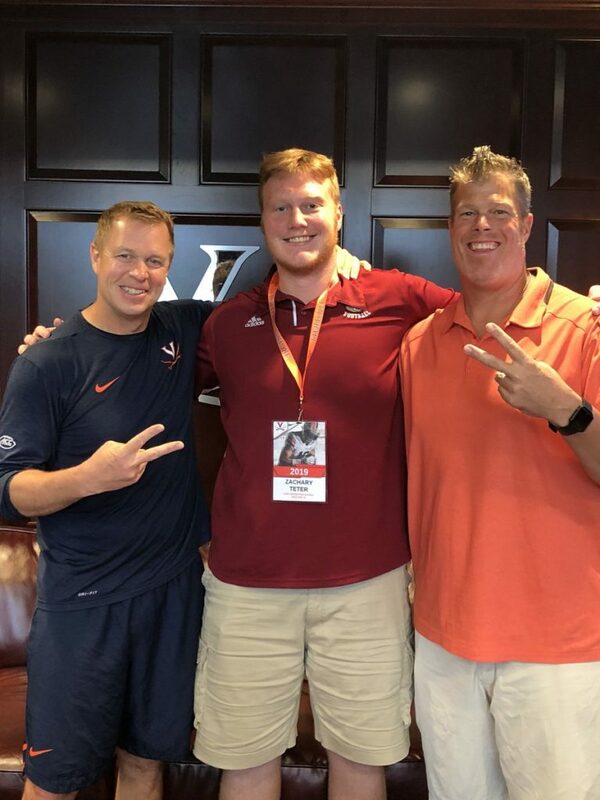 Teter, who pledged to Virginia on July 1, is one of three offensive linemen who have committed in class of 2019 recruiting, joining Kariem Al Soufi and Jonathan Leech. Moving forward, from a numbers perspective the depth chart is looking good. Scholarship projections for the next three seasons are listed below, and keep in mind that Virginia is likely not finished recruiting the offensive line in the class of 2019 and will surely address it further in 2020. The offensive line is one of the more difficult positions to recruit. The better the numbers, the better the chance of putting together a quality line. Mendenhall and company are getting the job done numbers-wise. Whether or not they can develop these players into a dominating unit remains to be seen. In the 2016 season, although leading rusher Taquan Mizzell averaged over 5 yards per carry Virginia’s offense averaged just 113.6 rushing yards per game (No. 121 nationally). The Hoos allowed an average of 3 sacks per game in 2016, which ranked 113 in the country. Virginia surrendered 2.38 sacks per game in the 2017 season, still below average as the Hoos were ranked No. 86 in the country in that category but still an improvement. The rushing game took a dive, though, as the 2017 Cavaliers averaged a meager 93.5 yards rushing per game and leading rusher Jordan Ellis averaged 3.89 yards per carry. Offensive line questions remain in 2018. Virginia’s 2016 and 2017 Class linemen will provide the answers. Fifth-year senior Jake Fieler (13 starts last season), graduate transfer fifth-year senior Marcus Applefield (10 starts at Rutgers last year), and fourth-year junior R.J. Proctor (13 games played last season, including five starts) provide experience and maturity for this year’s group. Redshirt sophomore Dillon Reinkensmeyer (13 games played, 11 starts), sophomore Chris Glaser (5 games played, 2 starts), and redshirt sophomore Ben Knutson (10 games played, two starts) had significant roles last year as well, with all three seeing the field for the first time in their collegiate careers. These six plus heralded redshirt freshmen Tyler Fannin and Ryan Nelson are the players I expect to be in the rotation this season, although redshirt freshmen Gerrik Vollmer and Ryan Swoboda and five first-year offensive linemen are competing as well. Fieler, Applefield, and Proctor will play big roles this season, but I see Reinkensmeyer, Knutson, Glaser, Fannin, and Nelson as key to Virginia’s success. If this young, talented group performs well in 2018, that obviously bodes well for this season’s prospects and likely for the foreseeable future as well. Another great article, in fact spot on. I would like to see more comments.